Seven officers from the Baltimore Police Department were indicted on federal racketeering charges on Wednesday, March 1. Among the crimes they were arrested for committing were large-scale overtime and attendance fraud, and the robberies of citizens that ranged from the seizure of possessions and money valued between $200 and $200,000. The bust comes after the Department of Justice released a report slamming Baltimore for unconstitutional stop and frisk practices that have lead to a disproportionate number of searches, excessive force and arrests among Black residents. The officers taken into custody were members of the department's Gun Trace Task Force, who are accused of stopping criminal suspects as well as random citizens, and taking cash, property and narcotics. 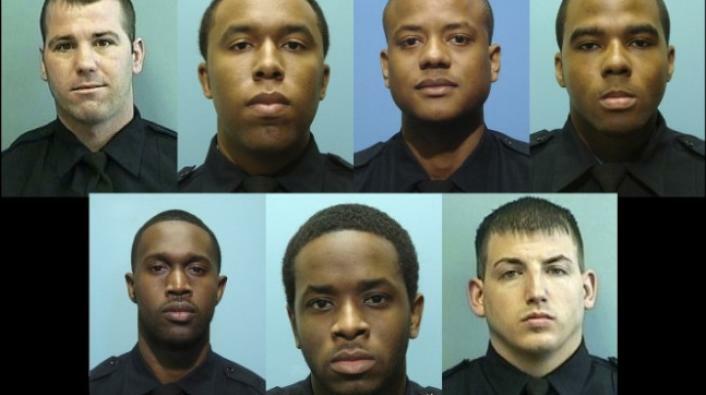 They have been identified as Detectives Momodu Gondo, Evodio Hendrix, Daniel Hersl, Jemell Rayam, Marcus Taylor, Maurice Ward, and Sgt. Wayne Jenkins. Maryland US Attorney Rod Rosenstein announced the indictments alongside the city's Police Commissioner and FBI and DEA officials, confirming that the arrests came as the result of a year-long investigation that found the officers had entered residences unwarranted, conducted frivolous traffic stops, and detained people without cause, all with the intention of lining their own pockets. "These are really robberies by people who are wearing police uniforms," said Rosenstein. They had also been detected as having stolen time from the department, with one officer reported to have documented himself working overtime hours while he was on vacation in Myrtle Beach, and two others bragging about scheming "at least $8,000 to $10,000 a month" in fraudulent overtime hours, during a tapped phone call.